It must be spring fever at Daily Paintworks! "Turning Point," - color study for pond painting, will ship tomorrow to its new home in Iowa. Thank you Kathy. 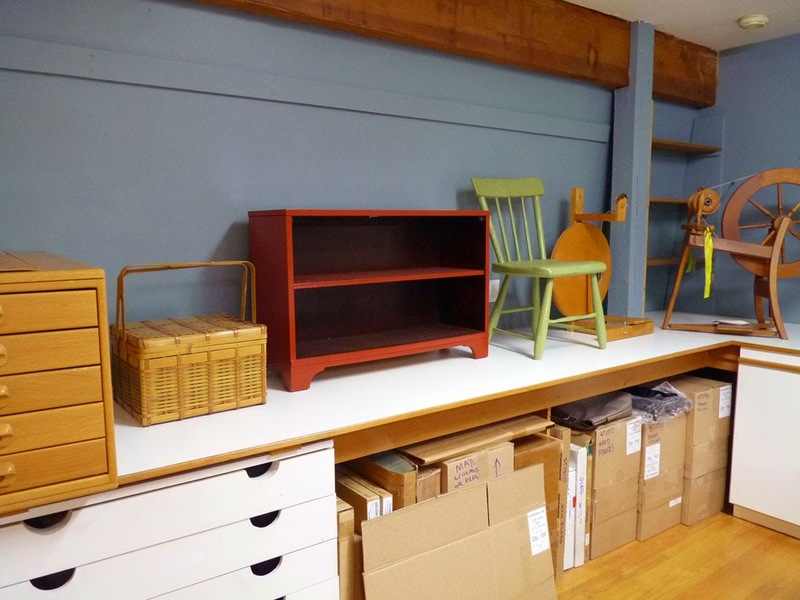 The studio is packed up in boxes ready for the move; I haven't posted any new art for months and have unsubscribed from most art blogs so I can focus on the tasks at hand (packing). Then...today, surprise! I received two purchases through Daily Paintworks. I knew right where one painting was (in my flat files) but the other one took a couple hours to find among the packed boxes. 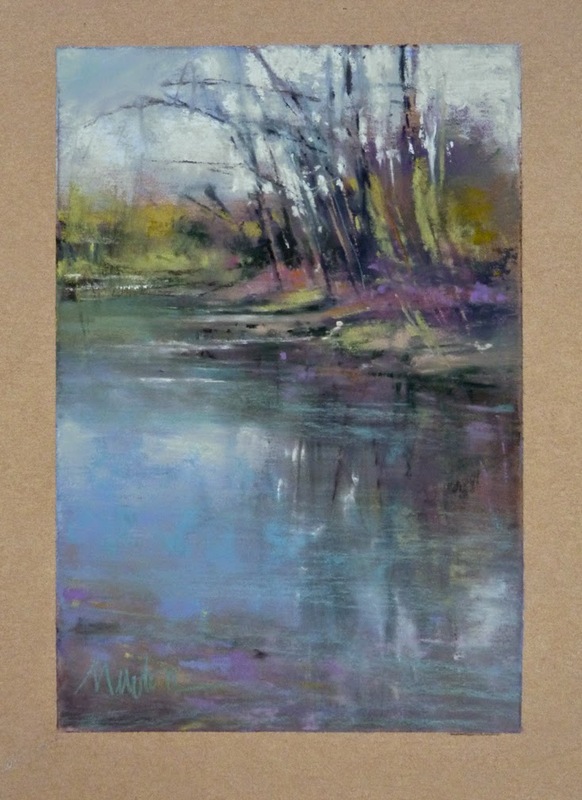 Fortunately, I made a note in my Art Database which box number it was in - otherwise I'd still be looking! I'm thankful for this crazy day. Autumn at Anahim Lake will go to a new home in NY. 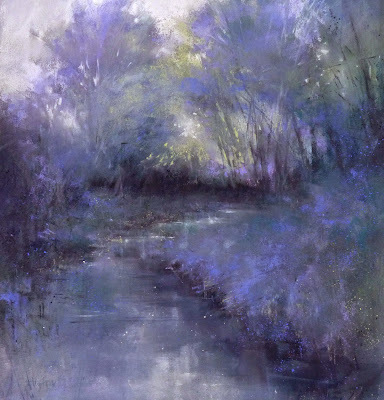 Study for River's Edge will go to a new home in Hawaii. I moved into my studio (formerly our two car garage) in 1989 and during the past 26 years I have painted the studio walls at least 6 times. This week I moved the flat files from their usual place to paint the wall behind. 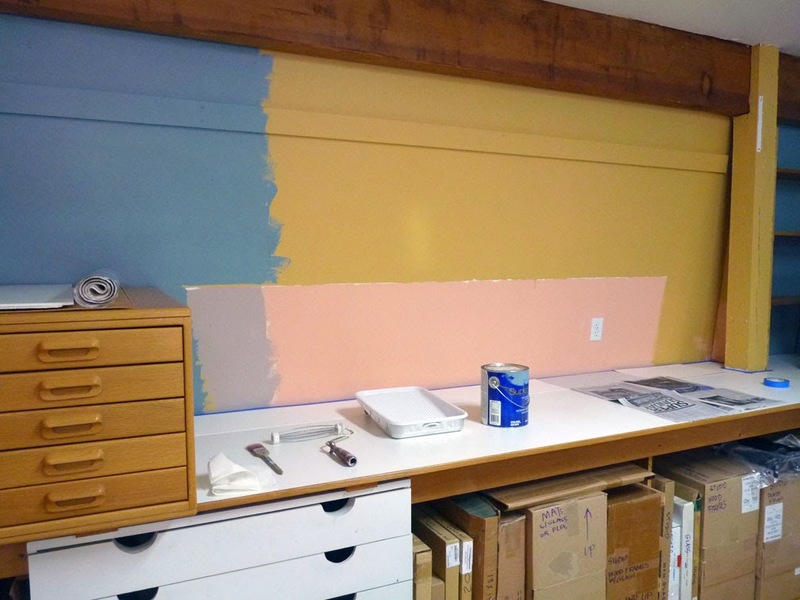 Of the colors shown here, the peachy color was first, then the French Gray, then a blue that isn't shown here, then the cork color and finally Benjamin Moore's Water's Edge Blue. Here is the wall now with furniture sitting upon the counter waiting the move to the new house. When all your art supplies are packed away, you are left with nothing to blog about except wall paint. Ooops! Updated Open Reception date for our Critique Group 20th Anniversary Exhibition at American Art Company in Tacoma is Saturday July 18th, 2-4 PM. 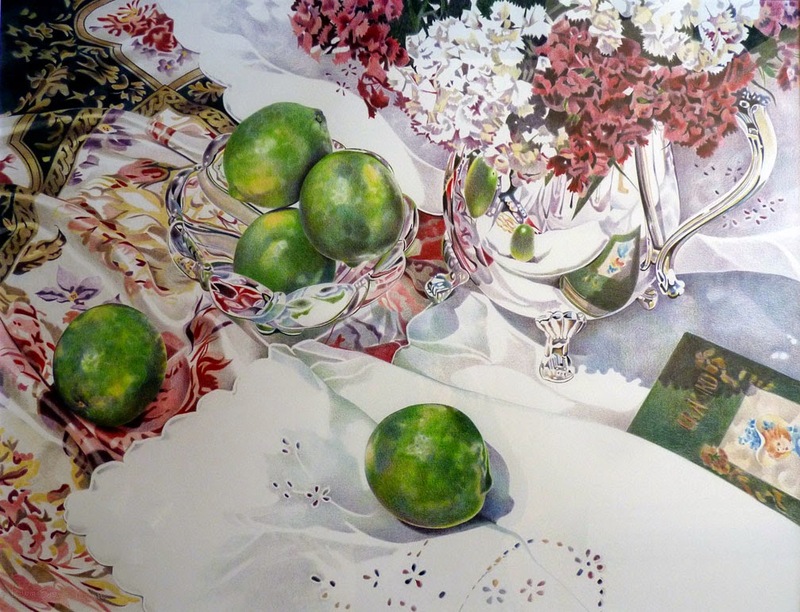 If you are a colored pencil enthusiast, you'll want to see this show. Many long years ago when I worked exclusively in colored pencil, several of us working in that medium started a Critique Group. Our group has met every other month for twenty years and this year, we are fortunate to have a Twentieth Anniversary Show at American Art Company in Tacoma, WA. Many thanks to Tammy, owner of AAC and to Kay Dewar and Sueellen Ross for co-chairing the exhibition. The show will open July 11th and run to September 5th. Opening Reception is Saturday, July 18th, 2-4 PM. We would love to see you there! Each artist will have six pieces in the show. Over the years, I have worked in other mediums so for me, this is a mini-retrospective. Below are my paintings that will be exhibited and available for purchase. 1999 - Worldly Goods, colored pencil on paper, 19 x 25 inches. Worldly Goods is in the style of my colored pencil work - sharp point, light touch, color lifted with reusable adhesive for added nuance. 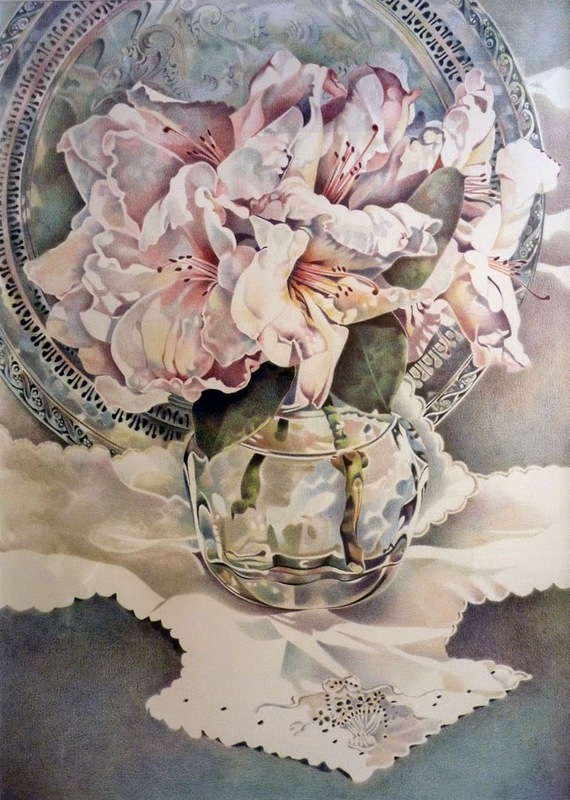 This drawing was featured in a step-by-step article for American Artist Magazine. I was working on it at the same time I was writing Colored Pencil Solution Book. When this drawing was complete I realized that in my confusion of shooting slides (remember slides?) for CPSB, I had failed to shoot slides of this painting for the step-by-step article. So, with this drawing as my reference, I created another quarter-size version of this painting and shot slides of that one for the article. That smaller version of Worldly Goods sold but I still have the original, larger version and am so happy to show it with this group. Two years later, I created Falling In Love Again. Still working in that meticulous circular stroke that I love. I love to NOT see a pencil "stroke." The texture of the paper was critical to the result I wanted. 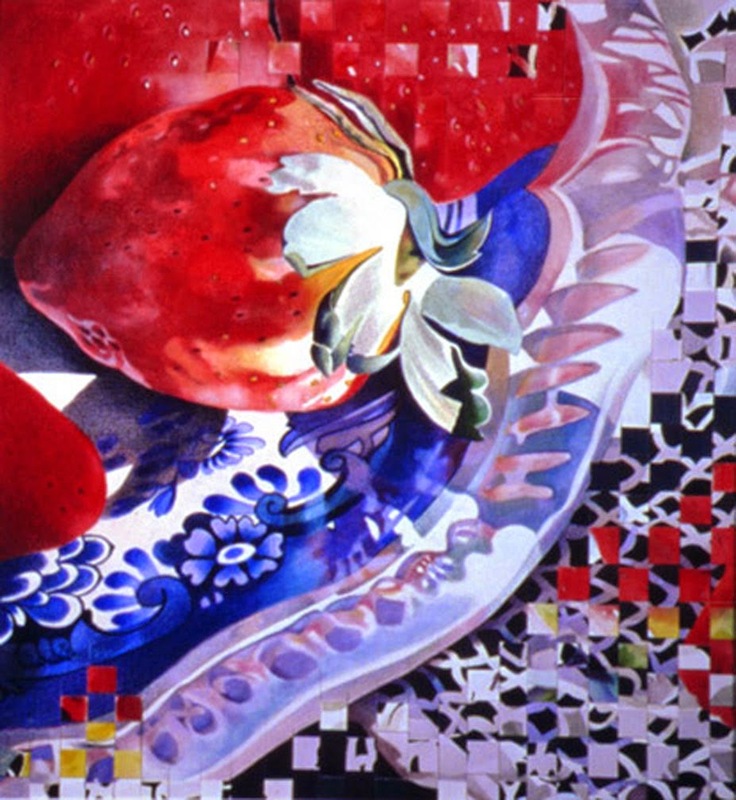 2002 - Strawberry Reflections, watercolor with colored pencil, woven surface, 14 x 13 inches. By 2002 I was experimenting with colored pencil applied over India ink and watercolor. This painting was originally about twice the size it is now and I wasn't pleased with the composition so I cut it in half, cut one of the halves into strips and wove the strips back into the other side in selected areas. I was pleased with the woven effect in Strawberry Reflections and began a series of pieces that appeared woven but weren't. Each square has an abstract quality but continues to relate to the whole in color, texture and shape. 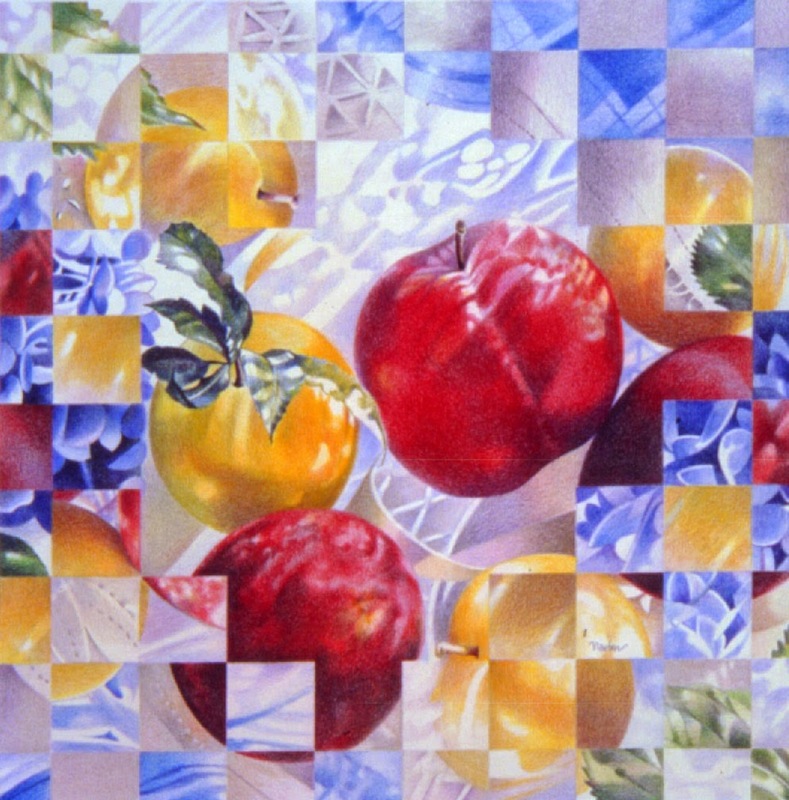 The plums in the center focal point are handled in a traditional realistic manner. 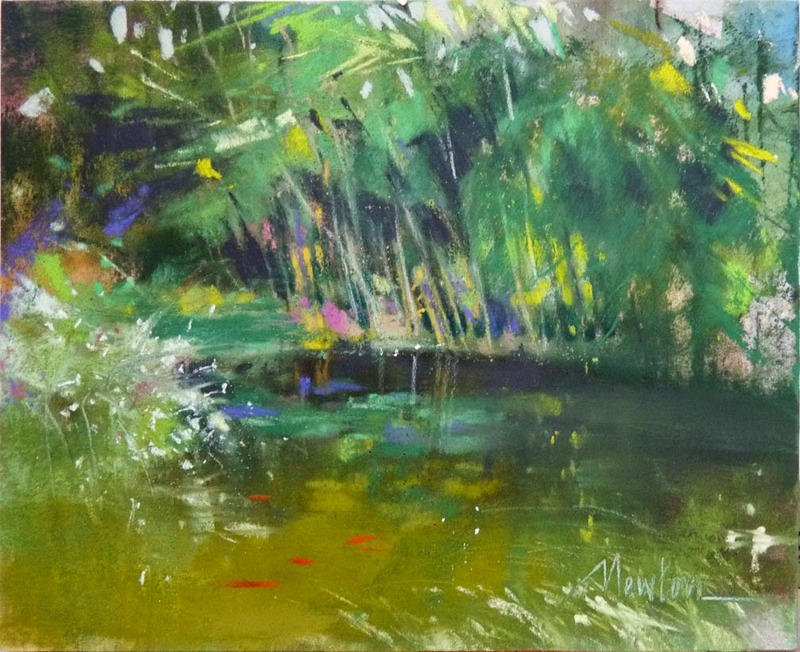 This painting is about abstraction, play of light and saturated color. 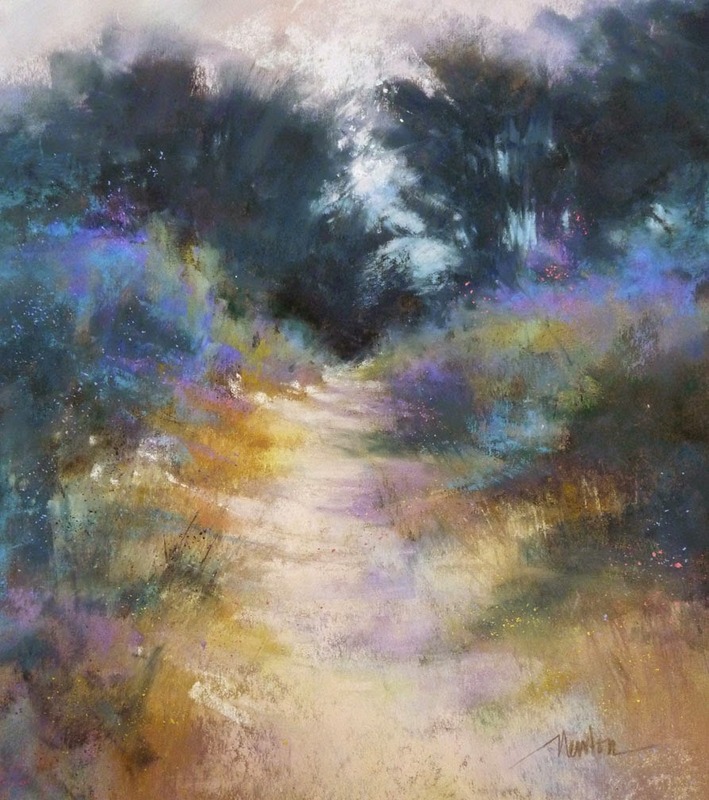 Completed in 2014, this pastel painting began years prior to that in a workshop with the amazing Elizabeth Mowry. Elizabeth quietly passed behind me checking on my progress without speaking. Her silence gave me confidence that I was doing OK. I finally told her I was about to apply a yellow and asked her opinion. She suggested a "quiet" yellow. I loved her workshop but this painting needed an update so in 2014 I reworked the top third and cropped a couple inches off the bottom. It comes with good memories that were found again when I worked on it the second time. My sixth painting in our group show is from my 2014 "Minds' Eye" series. Paintings from memory. 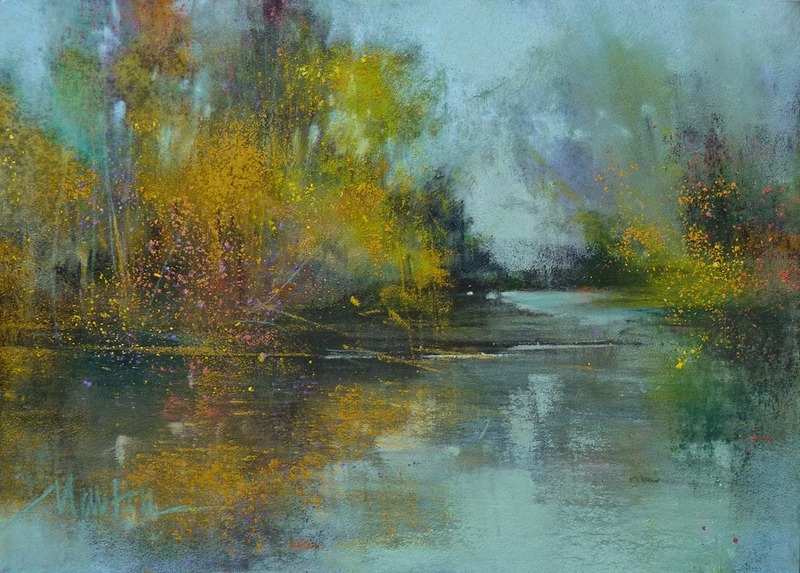 A woodland scene with small jewel-like reflections in the water. Click any image to enlarge. 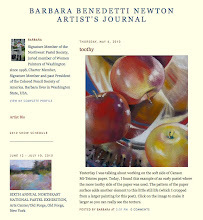 We hope you have a chance to see the show in person but it will also be online at the American Art Company website.